There aren’t many comics which have defined and influence the direction of a whole industry as much as Frank Millers. He’s written some of the most popular stories for some of the biggest comic characters and series he came up with maybe 30 years ago are still considered head of their time today. Frank Millers works haven’t always been a massive hit though, There was All Star Batman & Robin, the Boy Wonder which was released in 2006 with Jim Lee working on the artwork which was excellent for the ten issues it was but the sequel which would have continued the story and shown us the Dark Knight origin of Robin was never completed by Miller. Another attempt to return to the Dark Knight universe in 2011 was turned down by DC but later released by Legendary Comics under the title Holy terror and didn’t do too well due to it’s tone and message. The Dark Knight III: The Master Race aka DK3 is a 9 issue mini series written by Brian Azzerello, Frank Miller and illustrated by Muiller, Andy Kubert and Klaus Janson who has worked with Miller on a few titles. It follows on from Millers Dark Knight Returns and The Dark Knight Strikes Again, which told the story of Batman coming out of retirement to clean up Gotham City again. Throughout the series the villains and the stakes have risen which has made the Dark Knight book so interesting. He’s battled the Joker, a huge gang of villains and even Superman himself. You might ask what comes after Superman, surely Batman has his limits. but this series bits Batman up against his biggest challenge yet, an army of Kryptonians from the miniature city of Kandor. It’s such a well thought out series I find it hard to believe they managed to cram so much into nine issues but with the comic talent behind this book I’d expect no less. If every DC comic was this well thought out I think they could really take the lead over Marvel, the fact they have managed to include so many Justice League members without the need of several crossovers tells us it can be done. Ever since the series started in November 2015 I’ve been so hooked. It started off with a bang and it’s gotten louder with each issue. We start off thinking maybe Bruce Wayne might actually be dead but then they end it telling us he’s more alive then ever. The artwork has gone under a lot of scrutiny from fans, it’s good old classic noir artwork, not the digital stuff you see everywhere nowadays. I think it has a very nostalgic appearance to fans of comics in the 80s and 90s which has the potential to bring a lot of old comic book readers back who may have fallen out of love with DC back with the New 52 and continued reboots. Looking back on all nine issues this should have been called Dark Knight 3: Masterpiece, not Master Race, it’s one of those series which leaves readers wondering about what happened off screen and thirsty for another mini series using the same team. In fact I’d love to see them do more Justice League series, maybe a book focusing on Wonder Woman and The Atom, maybe even taking on Cyborg. To see other leaguers in the same light would be awesome. To say this series is well thought out would be an understatement, it’s pretty much taken one of the most popular and iconic Batman series ever conceived and rebooted it. We start off with the Justice League in pieces, see them crushed throughout and then in the end we see them come back tougher and stronger than ever before. We also are left with a Batman we’ve never seen before, I’d like to call him The Dark Knight 2.0. It’s Batman with all the experience and knowledge of his long career but in a rejuvenated body thanks to the Lazarus pit. Carrie Kelley the new Robin / Batwoman, Frank Miller has already said he’d like to make a story about her and to be honest I’d like to read it. I think it could be worth millions to DC if it’s done right, a movie about a retired Batman handing down the cowl to a female prodigy with all that furious skill with flashbacks to lessons she learnt from Batman. Bruce Wayne himself is young again. The possibilities for the Dark Knight universe have been blown wide open. Combining the experience we’ve seen along with his youth he could see Batman take on a whole host of new villains and challenges along with dealing with the side effects of the Lazarus pit. A Frank Miller Superman comic – When Frank Miller is asked about how Batman ends up taking out Superman he always says it’s because it’s a Batman comic. Which makes sense, but what would happen if he took on a Superman comic, how would that new edgy Superman be. 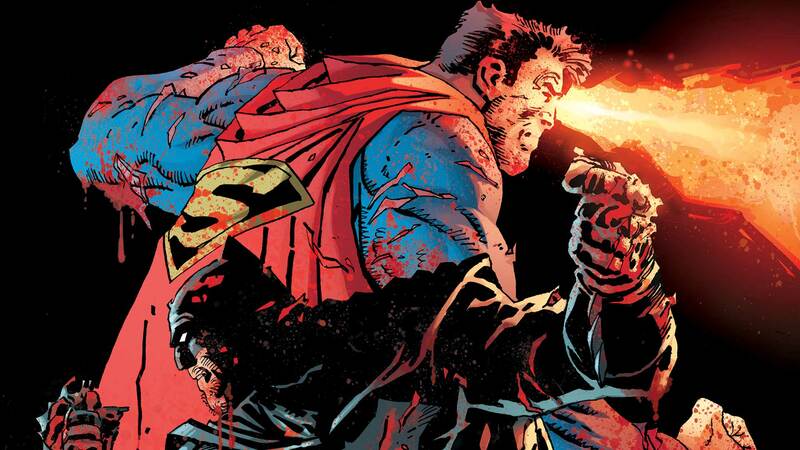 Imagine seeing Superman take on Darkseid or Zod in a violent noir style comic. Expanding the Team: This series has brought back a lot of great memories of how comics used to be written and produced, with DC producing a good 52 comics or so a month I’d love a few of them to be in this style, I think it would bring back a lot of old readers who have stopped reading DC comics because of the cross overs and reboots leaving them wondering where their beloved characters they grew up with are gone. Bring in a few more classic writers and artists and produce more comics like this. Overall I really enjoyed reading the Dark Knight III: Master Race, I’m glad I collected the standard issues along with the collectors edition hardback series, I’ll undoubtedly buy the collected TPB when it comes out too.